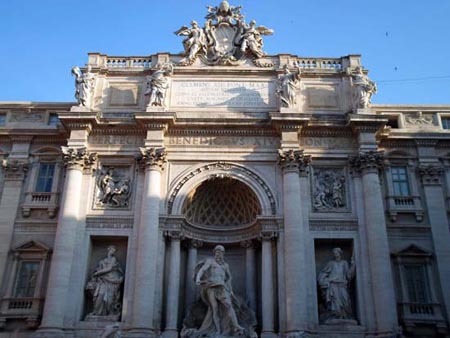 This short route begins at the Trevi Fountain and then follows the map as indicated below. Despite being brief, this route allows one to visit two of the apostles, a miraculous crucifix, and a Marian grotto. The following churches are listed according to the order of the suggested route. The total distance is about 1/3 of a mile. To walk will probably take about 1.5 hours when one stops at each of the churches. The churches are generally open from 7AM-1PM and from 4PM-7PM. Santa Rita da Cascia alle Vergine may not be open as frequently. *This church is north of Piazza Venezia. *A fire on the night of May 22, 1519 destroyed most of this church. Only the outer walls and a 15th century wooden crucifix survived. This miraculous crucifix can now be found in the fourth chapel on the right side of the nave. A relic of the true cross is also preserved within this chapel in a reliquary.